Wheelchair user Trish Gallalee bristles when asked her feelings about able-bodied people abusing handicapped parking placards and taking spaces meant for the disabled. "I really cannot stand the misuse by people who clearly are not disabled -- people running and jumping from cars," said Gallalee, of the Montgomery County Commission on People with Disabilities. Chuck Benagh, an Alexandria advocate for the disabled, was equally blunt: "People are lazy and people are selfish." The abuse appears to be rampant. 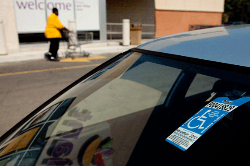 On Sept. 22, Howard County police and state motor vehicle officials stopped motorists who pulled into handicapped spots and asked them to show disabled driver's ID cards. Of the 42 drivers they approached, 12 were using tags that belonged to someone else, police said. In June, Alexandria police found that 90 percent of the drivers approached during a sting were illegally displaying someone else's tags, Capt. David Ray told WTOP. Drivers caught with illegal tags in Virginia, Maryland or the District can be fined $250 to $500 and have the tags revoked. According to a University of Wisconsin study from 2002, the majority of cars parked in handicapped reserved spaces are parked there illegally, with a 70 percent violation rate in cities and 44 percent in towns. One in 10 drivers in the capital region has a permanent handicapped placard or plate, according to state records. Authorities say the tags are being abused, with doctors handing them out like candy, people using someone else's tags, and counterfeit tags available on the Internet. The issue became a hot topic after police towed a woman's Lexus from a handicapped spot as a security measure during a downtown D.C. speech by President Obama on Saturday night. A Washington Post article about the towing angered many readers -- not because of the towing but because the Randallsville, Md., resident wasn't handicapped and she was using a tag belonging to someone who was not with her. "It's just arrogant to think that you have a right to park there with someone's else placard," said Bob Herman, an attorney with the Paralyzed Veterans of America. "She's got to know that's against the law." In Martena Clinton's case, District police and Maryland Motor Vehicle Administration officials said they do not plan to investigate the incident. Police said an officer generally has to observe the violation to make the charge stick, and Maryland officials said they only investigate when the person who was issued the tag appears to be breaking the law. "Then why have a law? That just perpetuates the problem," said Bob Faro, the father of a son with muscular dystrophy who used a wheelchair the last 10 years of his life. Faro now has a son who is a Marine and was severely wounded in Afghanistan on May 19. He has spent four months traveling between Bethesda's National Naval Medical Center and the Veterans Administration in Richmond. During that time, he said he has seen repeated misuse of handicapped parking spaces. The situation is the same in Montgomery County, where wheelchair user Aaron Kaufman, who serves on the Montgomery County Commission on People with Disabilities, says police don't make enforcement enough of a priority. "People know that if they park there, chances are they're going to park without any sort of consequence," Kaufman said.